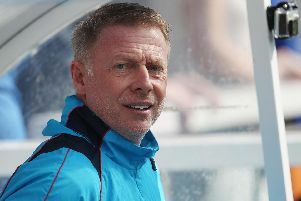 Nicky Featherstone admits he is putting his own Hartlepool United future on the backburner. The midfielder has been instrumental in the club’s turnaround in recent months. And he is the type of player many would like to see remain at Victoria Park next season, whoever is at the helm. But Featherstone says that decision can wait until the summer - there’s a relegation battle to win first. “That decision has not been taken,” he said when asked about his Pools future. “There is no manager here so we’ll have to wait until the end of the season. “I’ve enjoyed my time under Matthew Bates, it would be nice if he could get the job. Featherstone is in his fourth season at Pools and his deal is up and the end of the current campaign. During that time the club have wandered from one relegation battle to the next. And the 29-year-old has become accoustomed to Pools not making things easy for themselves, much like they have this season. He said: “We do make it hard for ourselves, don’t we? “We have the last few years since I’ve been here. But you can see the reaction Batesy has got from the lads, we’re all working for him and barring the previous two results it’s all been positive since he’s been in charge. Featherstone continued: “It’s been difficult since I came to the club, there have been difficulties on and off the pitch, changes in manager. Featherstone is not one of the only ones to impress of late under Bates. One player who has really come to the fore under the caretaker has been youngster Josh Hawkes. Featherstone sees a bright future for the teenager. “That’s what the likes of him Woodsy and Newts offer, a goal threat,” said Featherstone of the weekend goalscorer. “There are a few frustrations at times without the ball, but we’ll accept that if he bangs in the ball like that! “He’s got great technique, he has a bit of learning to do when we’ve not got the ball, but he’s only young. The weekend point at Sutton was unexpected, especially with the ambitions of the pair in the run up to kick off. The Surrey outfit are eyeing a spot in the Football League, while Pools are content to remain in the fifth tier. Reflecting on the clash, Featherstone said: “I think you’d have taken a point after that first 10 minutes. “It’s a tough place to come to, the way they play is very direct, they are a big physical side. “They came out strong and direct, it took us a good 45 minutes to get hold of it.